We’re often asked how we find students to join our program. They are surprised to learn that it is completely by word of mouth. 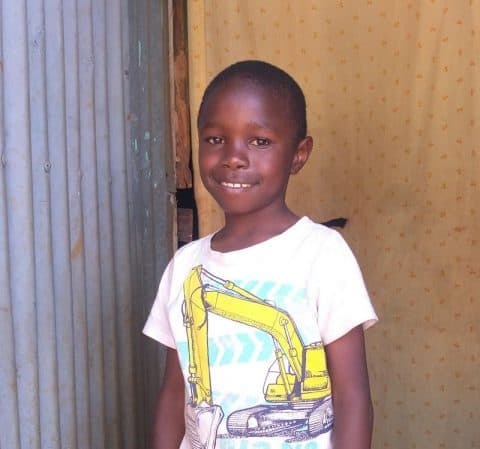 In the Dagoretti slums of Nairobi there are many HIV support groups and word spreads quickly that Friends of Ngong Program will provide a real chance for their children. It is often mothers or aunts in these programs who immediately bring their children to our office to see if they can join us. I am a mother myself and wish we could support all of the students. 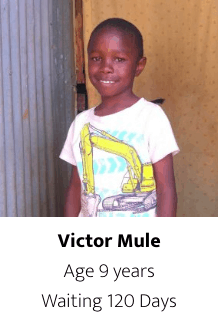 It breaks my heart when ailing mothers come to our office accompanied by their little ones asking if their children have been matched with a sponsor. It is emotionally draining to see their pain every day. However, they have hope that they will be matched with a sponsor and get to join the program for a chance at a transformed life. Would you be able to sponsor one of the students above? For approximately $2/day, you can give a student a chance through education. 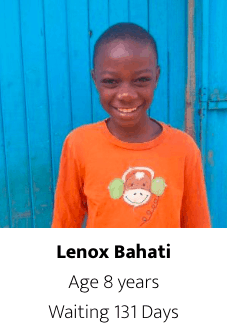 Let’s spread the word and give children like Lenox, Victor and Dorcas a chance. This spring we decided to ask our sponsors and donors for help raising funds to purchase and fill school trunks for our secondary boarding students. In Kenya it is common for secondary students go away to live at school. This may seem odd for those of us in the U.S. who are used to teenagers living at home until they finish high school but for these students and their families it is a huge benefit. At school the students are cared for, fed, have beds of their own and are able to focus on their studies instead of worrying about life in the slums. Each year we equip our secondary students with trunks filled with everything they need for the term. The students receive refills of these items each term when they come home to visit their families and stop by the office to meet with their case workers. The trunks are filled with a restricted list of the necessities of life such as shampoo and body wash, laundry supplies to hand wash clothing, toilet paper, feminine products, toothbrush and toothpaste, body moisturizer, pens and other school supplies. All students are required to bring the listed supplies and nothing else – no cell phone, no extra clothing – nothing that would separate one child from another. In this way, all the children are equal as far as life at school is concerned. Thank you for helping us make the first annual Spring Appeal a success! Your donations will make a significant impact on our fundraising efforts for the year, and therefore will make a significant impact on the hundreds of students in our program. 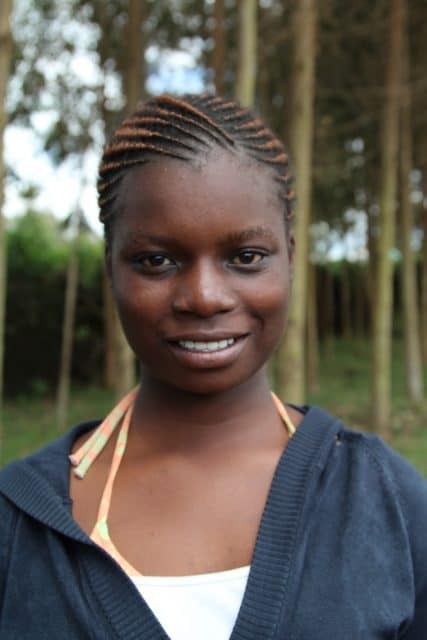 Cynthia Adhiambo joined the program in 2008 in class five. 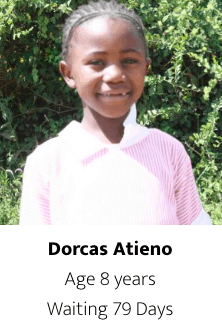 I became her sponsor in 2012 after I first visited Kenya and asked the program director to find a second girl for me to sponsor. Her brother Godfrey is in 12th grade now and in the program. 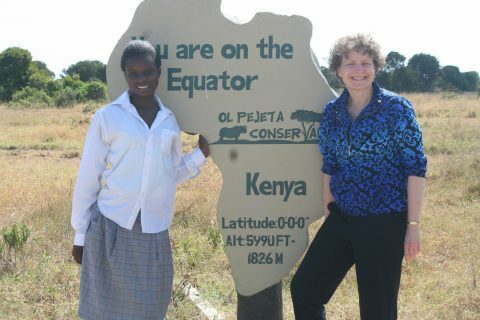 Her sister, Veraly, is not in the program because she lives with their grandmother in rural Kenya, and Cynthia was always very worried about her. Her mother died in 2015 from HIV related complications. After her mother passed, Cynthia and the siblings were left under their father’s care; she was also close to her uncle. She had an eye condition which was finally corrected by surgery; and she had had malaria which recurred. She was shy and soft-spoken, easily embarrassed and often lacking in confidence except in church, where she could belt out “Praise God.” The photo of two of my sponsored students, Sharon and Cynthia, is from my first visit, and you can see how shy yet happy Cynthia was. 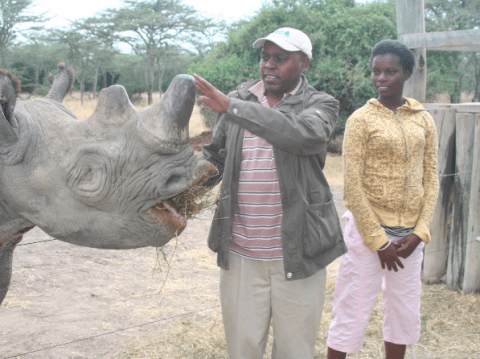 As you can see from the safari picture, she was not sure she wanted to touch the rhinoceros, but she got pretty close. On safari, she tried hard to use the binoculars in order to please me, a birder. She would arrive in camp clutching plastic bags with no suitcase or pillow. She was especially thrilled last summer to learn how to knit. The photo of her participation in our yoga routine for talent night shows what a beautiful young woman she had become. Cynthia completed her coursework and final project at the Kenya Institute of Management for a Diploma in Sales and Marketing and was hoping to graduate at the end of the year. Despite her soft-spokenness, she was selected to be a YPP (Youth Peer Provider) trainer in NRCA’s Sexual and Reproductive Health Program. She had also started creating awareness on the importance of menstrual hygiene to primary and high school girls this year. She was thrilled to be selected for the group and listened intently to all the programs. She was also chosen to be a squad leader for summer camp in 2014. Cynthia was very sick in mid-March and was admitted at Kenyatta National Hospital where she was diagnosed with GBS (Guillain-Barre Syndrome). She died on April 3rd, 2019. I treasure the many sweet handwritten letters she sent me, although in the last few years we had mostly emailed or chatted via WhatsApp. Her Christmas greeting to me expressed how much she loved the YPP program. I have the beautiful thank you card she wrote to me, always referring to me as Mum. Some of my most treasured memories were of shopping with her to prepare for school and taking her to eat chicken (for a slender girl, she could put away a lot of chicken!). It is hard to convey how much pleasure it gave me to see how thrilled she was to have a new dress or a new pair of jeans, especially when I think of how hard life was for her after her Mom died. Cynthia often found temporary work washing neighbors’ clothes to pay the family’s rent and ensure they had the essentials as she went off to school. Despite the fact that she often went without food, she would be the first to urge me to share our carry out with a hungry child begging on the street. It seems so sad to lose her now, just as she had really hit her stride and overcome so many obstacles. I love her, will miss her terribly, but will never forget her. Thank You for Making the 2018 Annual Appeal a Success! Thanks to our generous donors we met the 2018 Truscott Family Match of $65,000 and more! Thank you to everyone who donated generously to provide important programming for students to transform their lives through education in Kenya. The Friends of Ngong Road Annual Appeal funds elements of our program that sponsorship does not. This includes nutrition support, healthcare, Saturday Program, caseworker support, the library, computer lab and more. This year’s annual appeal success of just under $160,000 raised could cover the cost of 6,400 meals for families who are particularly needy, or 200 new computers for the computer lab, or the gap for 320 students who attend boarding school but their sponsors are only able to provide tuition support. A very special thank you to Ted and Kathy Truscott for making this important appeal possible. From the children, their families, and Friends of Ngong Road, “Asante Sana.” Thank you very much. Do you remember how you learned about Friends of Ngong Road? Chances are, you knew someone who was involved as a donor, sponsor or volunteer. They told you about the difference the organization was making for children in Kenya for a relatively small investment. You signed up for our newsletter, came to an event, gave a donation, sponsored a student, or started following us on social media because you believe in the mission and trust your friend or family member. 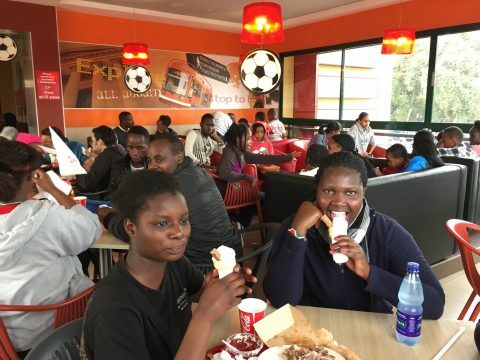 Friends and family networks are the most common path for people getting involved at Friends of Ngong Road. We are now formalizing that friends and family method with the introduction of our new Ambassador Program as a strategy for growth. 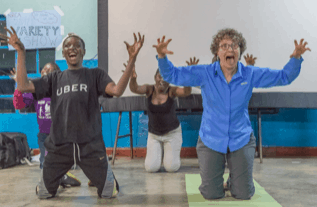 Ambassadors are people who know and love Friends of Ngong Road, agree to learn more about it through ongoing learning opportunities and commit to recruit two sponsors and raise $2,000 each year for two years. Ambassadors can be of any age, background, and experience with the organization. Ambassadors believe in the mission and want others to know about the chance they have to completely change the trajectory of a child’s life for a relatively small investment of approximately $2 per day. They believe the opportunity to change a child’s life is too important to not be spread. A shout out to the first four Ambassadors who started volunteering with the organization last month. They are high-energy, dedicated leaders paving the way for this program and creating more opportunities for students to join the program and transform their own lives. We thank you! 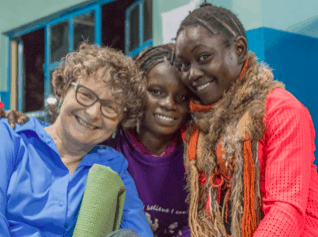 If you are interested in becoming an Ambassador, please contact Lacey Kraft at lacey@ngongroad.org or 612-568-4211.